Absolutely! While researching these.. I was wondering.. why didn't I pick these up earlier? Both stats and fundamentals are looking so good. Glad to see you as a fellow shareholder! Haha. I guess that's an advantage of being a foreigner in this US investing business... I can't be a customer of AT&T. The payout ratio is very high, but that's not uncommon in the sector. The yield is just amazing. The stock is very affordable as well. It's worth starting a research session for! Wow you sure have been busy so far in July. Congrats on the purchases, I think they're all very solid. Thanks Tawcan! I was happy with my progress as well, if I may say so, haha. Nice purchases, DFS. I know TROW is popular with other DGIs these days...and on the surface, looks like a good investment - even though I havent delved into the books deeply. I am huge fan of QCOM...love the technology and the segments - chip business and the licensing business. Even in an Apple phone, there is QCOM technology - so you get a cut for licensing even if they dont use the chipset. Thats the beauty of QCOM that I love - no matter who wins in the competition, the common denominator is QCOM - always a winner. Having said that - I have to point out that Apple is much more than a device company. Yes, iPhones bring in the most revenue for the company - but the innovation in the future will reside in software and the ecosystem. The full experience provided for users will keep the cash flowing for years to come. Fan of AT&T as well - another one of my holding. Long AAPL, QCOM & T.
Thanks for this nice extra information on QCOM. I did not know that! As you know, the phone market is very competitive, so it's nice to have a 'always win' company in our portfolio. You are definitely right. Apple wouldn't be anywhere close to where they are today, if they were just selling iPhones. For all we know, they could have end up like Nokia did. Once the biggest mobile phone company worldwide, currently a small division of MSFT. I am long on both TROW and ATT. I have QCOM on my Watch list forever since their debt is zero (or close to). They didn't have the competitive edge like they did during the CDMA days, but their patents portfolio is very strong. Like you say, their LTE chipset is in a lot of devices. So, in all, excellent buys! Thanks for stopping by Div Son! Yea the company is looking pretty strong from a valuation point of view. We'll see what future phones will bring us. I have confidence! Great buys. 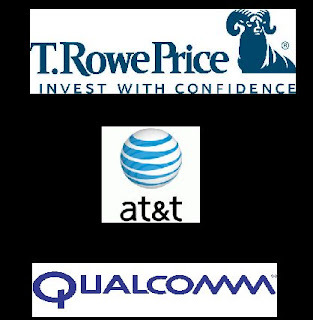 Don't own TROW but we do own AT&T and QCOM. Really like QCOM because all the cellphone business and LTE growth. Thanks for your continued support Tawcan! AT&T has proven to be here to stay and I'm sure QCOM will be as well.